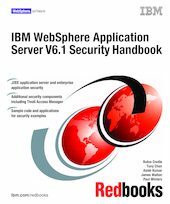 This IBM® Redbooks® publication is part of the IBM WebSphere® V6.1 series. It focuses on security and related topics, as well as provides technical details for designing and implementing secure solutions with WebSphere. Designed for IT architects, IT specialists, application designers, application developers, application assemblers, application deployers, and consultants, this book provides information about designing, developing, and deploying secure e-business applications using IBM WebSphere Application Server V6.1. It discusses theory and presents proven exercises performed in our lab by using sample applications. Part 1 discusses security for the application server and its components, including enterprise applications. It focuses on administrative security and application security, which were previously known as global security. It includes essential information about how to secure Web and Enterprise JavaBeans™ (EJB™) applications and how to develop a Java™ client using security. Part 2 introduces additional components from the enterprise environment and discusses security beyond the application server. External components include third-party security servers, messaging clients and servers, and database servers. Part 3 provides a short introduction to development environment security. It includes guidelines and best practices that are applicable to a secure development environment.